The Pilanesberg Game Reserve is extremely beautiful, with rolling hills and even an extinct volcano making up the reserve. Thick vegetation contrasts sparse brown grassy fields, where herds of zebra and various species of antelope can be seen in their numbers, and tall giraffes stalk along the horizon, a picturesque setting for South Africa expedition holidays. The abundance of game on the reserve is the result of Africa's biggest game relocation project which was conducted in the 1970s, known as Operation Genesis. Critics use this to argue that the game park lacks in authenticity. However, the more compelling arguments is that the project simply enabled an area of land with enormous potential to preserve and house a large number of game and wildlife. Without this operation, the fantastic South Africa expedition opportunity the Pilanesberg affords would not be possible. 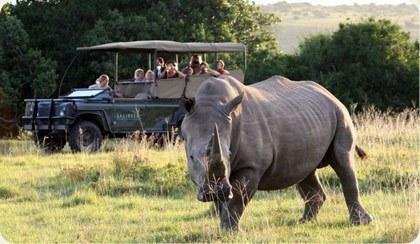 Rhino, leopard, lion, buffalo and elephant make up Africa's Big Five. 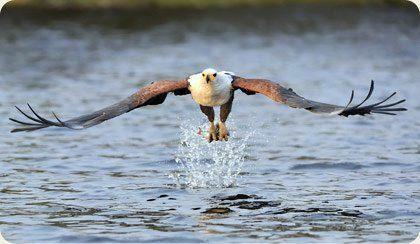 And the Pilanesberg Game Reserve is home to all of them. While on your luxury South Africa expedition holiday in the Pilanesberg, you will be in a prime location for viewing lions. These stately creatures can often be spotted padding along the reserve's roads. They like sticking to the roads for 3 reasons. Firstly, the sun heats up the tar and makes the roads nice and warm for travel along. Secondly, the roads are free of shrubs and bushes, making for cushy and convenient paths. And thirdly, the roads tend to lead to waterholes, so they are the very routes the lions would naturally take. Many visitors to the park spot whole prides of lions on every single game drive, as these magnificent beasts patrol their kingdom. The elephant population is large too, and lucky spectators will enjoy viewing these enormous creatures as they go about their regular lives whilst you are on your luxury South Africa expedition holiday. Game viewing in the park begins at the crack of dawn, and rangers typically call guests at around 5am to wake up for their 5:30am game drives. The drives are conducted in open air land rovers, and it's very pleasant to sit wrapped up in a blanket as the sun rises over the hills, and the animals start making their way to waterholes. The rangers usually stop off half way through the game drive for coffee and rusks (chunky, traditional South African biscuits), where you can continue to enjoy the sunrise from a particularly pretty spot whilst on expedition in South Africa.